Living a Fit and Full Life: Vince Camuto Ciao Eau de Parfum is the Romantic Fragrance that's Both Contagious and Unforgettable! 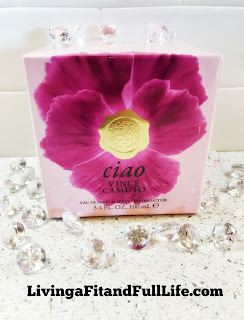 Vince Camuto Ciao Eau de Parfum is the Romantic Fragrance that's Both Contagious and Unforgettable! A pioneer of the 20th century footwear industry and co-founder of Nine West, Vince Camuto (1936-2015) is credited with revolutionizing America’s affordable fashion footwear market. In 2001, Camuto founded Camuto Group as a retail resource for the design, development and distribution of women’s fashion footwear. Over the next 14 years he diversified the company, acquired licenses and partners, introduced brands and built Camuto Group into a global business. Romantic, flirty and fearless, the woman who wears Ciao greets—and embraces—the world with a free spirit and fresh, positive attitude. Ciao’s scent story opens with tangy Italian Mandarin and Pink Grapefruit, grounded by Wild Strawberry and shimmering Blackberry. A floral heart unfurls with a bouquet of Rose, Peony, soft Muguet, Italian Honeysuckle, Pink Jasmine and Passionflower. Base notes of Glowing Amber, Cashmeran, Amaro Liquor, Sandalwood and Indonesian Patchouli create a smoldering finish. Vince Camuto Ciao Eau de Parfum is the romantic fragrance that's both contagious and unforgettable! 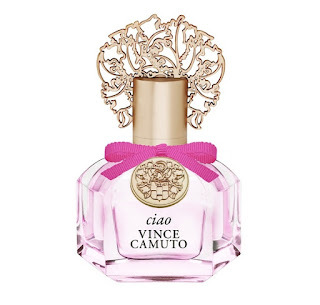 Vince Camuto Ciao Eau de Parfum smells amazingly good! It's the perfect romantic fragrance for summer. I cannot even begin to tell you how many compliments I've gotten while wearing it. Vince Camuto Ciao Eau de Parfum definitely seems to be liked by just about everyone. I'm usually very picky about my fragrances and don't like them to be overpowering. I like my fragrances to be subtle yet still linger for a bit which is exactly what Ciao Eau de Parfum does. I also have to tell you guys how beautiful the perfume bottle is for this scent. It looks incredibly elegant and beautiful on my bathroom vanity. It's absolutely stunning. Vince Camuto Ciao Eau de Parfum is an amazingly beautiful perfume that you'll definitely want to get your hands on! Click HERE to find a store near you that sells Vince Camuto! Click HERE to learn more about Vince Camuto! Follow Vince Camuto on social media!